Through song and teaching the Scriptures, to educate and encourage Christians to understand their CALLING from G-d to be a witness of The Light, to minister G-d’s love to the Jewish People, and as Esther, to petition Heaven on behalf of Israel. To help return Jewish People to the Land of Israel and provide aid to sustain them there. To help other ministries who pray for and encourage the Jewish People to fulfill Bible Prophecy in their calling to maintain Israel as a Jewish state and be a light to the nations, aid the poor and victims of terror. BJ is a Messianic Jewish Believer in Yeshua (Jesus). He was born in New York City and grew up in South Carolina. He began to write music in collage and entered the folk music scene in New Orleans, New York, Chicago, and elsewhere in the early 1970s. He met his Messiah in 1978 through the efforts of Gentile believers who prayed for and witnessed to him gently, diligently, and sacrificially in spite of anger, rejection, ridicule, and discouragement. BJ was co-founder and co-leader of a Messianic synagogue in SC. He later helped start an international Christian ministry to support Israel and educate Christians in their Scriptural relationship to Israel and the Jewish People. Teaching and singing in Churches and Groups encouraging support for Israel. Prayer and Worship for Israel and the Nations- CTJ Min is active in forming and supporting groups for prayer and prophetic worship directed to the Jew first as well as our nation and the world, Along with others in our community, we are praying and working toward a place for 24 hour worship and healing. 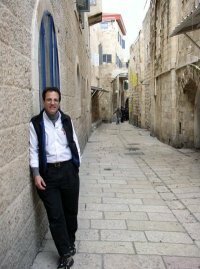 CTJ is active in supporting the ACR (American Christian Reserve), now ISRAEL ALWAYS, which teaches Christians of their commission from G-d to comfort, love, and support Israel and to understand and defend the Jewish People against the Anti-Semitism that is so pervasive today that we sometimes don’t recognize it. The WALL WARRIOR PROGRAM was an ACR commitment to have a Christian praying at the Western Wall in Jerusalem 8 hours a day for a full year during 2005 and 2006. It has made an important impression on the Jewish people and Government officials in Israel, as they have watched the sacrifice of believers to pray with them and for them in this way. ISRAEL ALWAYS / Jerusalem tours encourage Christians to visit Israel to see the sites and pray at the wall. This supports Israel economically and emotionally and in a very tangible and visible way shows YOUR love to the Jewish People.